The crisis in Zimbabwe is escalating. The effects of the legitimacy crisis continue to arrest Zimbabwe and calls for genuine dialogue seem to have fallen on deaf ears in spite of the unpalatable suffering of the working people. There is closure of the democratic space, an obvious result of tyrannical consolidation in Zimbabwe and the continuation of a new state in which there is conflation of the party and the state. There is a continuation of the old order of economic lethargy, economic destruction, corruption and patronage. The Monetary Policy Statement presented in February by the RBZ governor has compounded problems in the Zimbabwean economy. It has escalated speculative behavior and formalized rent seeking transactions by the elite while the masses are at the receiving end of price hikes including basics like bread. 1.It introduced a new currency through the back door without addressing the fundamentals including the relationship between exports and imports (Trade Position) and more importantly the social contract. An abused citizen rejects the authority of the state and the currency becomes an immediate casualty. 2. Illegal forfeiture of foreign currency through a retention scheme which will result in creating extra legal means of correction by exporters. 3. State sponsored rent selling platforms in which the political elites will still access united state dollars at the RBZ using the 1:1 rate stipulated in section 43 of the RBZ Act which has not been repealed, and selling it on the so called interbank platform or even the alternative black market. 4. Creation of a state-initiated inflationary environment. 5. Floating the RTGS dollar resulted in a deliberate devaluation of people's savings in bank accounts which were not ring-fenced with no mention of compensation. In short, the monetary policy blew an opportunity to resolve the fundamental questions. We have offered as the alternative to say in order to move forward, you need to restore trust and confidence, but in order to restore this confidence, you need to have SMART economic measures and we have offered those measures to Mr. Mnangagwa and his team, but we have seen that they are ignoring that alternative. Today the price of bread went up again; basic commodities' price hikes continue unabated and fuel shortages continue despite the fiction around fixing the price upwards. The cost of living is increasing, earnings especially those of public servants remain stagnant. Labour unrest has characterized the first quarter of 2019; Industrial action and a stay away ensued due to the employer's failure to address the grievances of the employees. We saw the destruction of livelihoods in the manner of Murambatsvina of 2005. At least 17 people are reported to have been killed in January of 2019 on account of the state's heavy handedness. Beyond these killings, there has been a systematic targeting of MDC members including senior leaders, MPs and Councilors. Leaders of the ZCTU and civic society were also targeted. There has been invasion of homes, abductions, and arbitrary arrests, mass and fast tracked trials. The level of Human rights violation is worsening by the day. Hon Morgen Komichi, Hon Tendai Biti, Hon Charlton Hwende, Hon Amos Chibaya, Hon Happymore Chidziva, Hon Godfrey Sithole, Hon Levi Chimina, Hon Lloyd Mukapiko, Hon Settlement Chikwinya and Hon Joanna Mamombe have all been brought before the courts on trumped up charges. Resultantly, Zimbabwe has plunged further down the democracy indices in the world. The failure to live by the minimum standards set out in different International Conventions has resulted in the further isolation of Zimbabwe by international actors. The case in point is the discussions in the European Parliament, the British Parliament and recently the position taken by the United States of America to deal with self-inflicted problems in Zimbabwe. 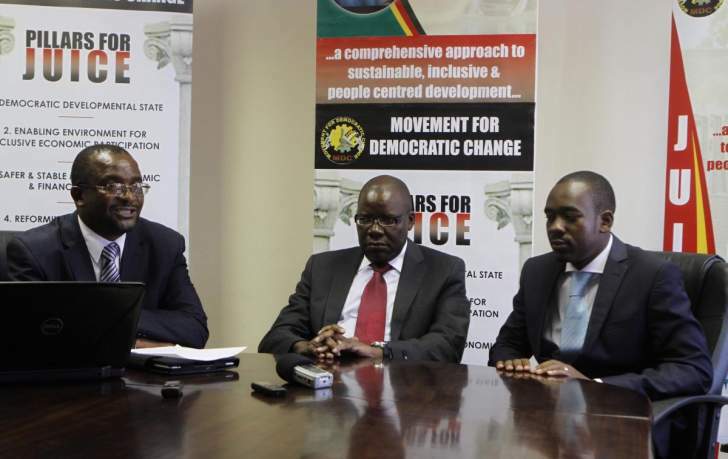 We have always made the point that Zimbabwe must dialogue and have a comprehensive reform program. It requires no money. The returns we get from respecting the rule of law, human rights and Constitutionalism is higher than the narrow benefit of power retention. We make the point for key reforms in our five point plan to legitimacy. To resolve the challenges arresting Zimbabwe, the MDC continues to propose dialogue anchored on the following five key areas. d. Resolution on the agenda of nation building, national healing and the resolution of the social contract. e. International reengagement and ending Zimbabwe's isolation and the integration in the international community. To date, no dialogue has taken place. Mr Mnangagwa has not responded to the 6th of February 2019 letter written to him by the MDC about dialogue. We have stated that the dispute is around legitimacy; therefore, it is impossible for any of the two actors to be the convener of dialogue. We have set minimum conditions for genuine dialogue that has the capacity to resolve the current impasse. The Congress of 24-26 May 2019 is the fifth National Congress of the MDC. In the two decades of the party's existence, Dr Morgan Tsvangirai, our late icon, has groomed enough leaders to steer the Party of excellence forward. Service and sacrifice continues to define the character and nature of the MDC leadership. We brought the energy and revived the people's party of excellence, the party is united and revitalized; we have rebooted the zeal and enthusiasm for change, igniting the hopes of many, in Zimbabwe, the African continent and beyond. We soared above limitations, exceeded expectations and defied the odds. The people's outstanding efforts were amazing. We made giant leaps. We are the leading party and a government in almost all urban areas. We are the government in 28 of the 32 of our major cities and towns. Our mayors are doing a fantastic job, save for a few who need to be assisted. Our competitor is losing ground. We are gaining ground. They are discredited, we are credible. We were voted for by a mammoth 2,6 million people, if you are honest or 2.1 million if you are dishonest. Attracting members from the opposite side including some eminent ones, is no mean feat. What a great achievement! We thank all those who believed and continue to believe in us. As you may know, a party that governs does so by destroying the base of the opposite side. We have done so well. The upcoming 5th Congress is a turning point for the MDC, we are moving to another level. We have a platform to set a new culture, new infrastructure, new systems, new ideas, new tactics and strategies. While defining a new course for Zimbabwe! We will show the world that the MDC is a producer of democracy. Change is our style and fashion. Change is our way of life. This is our chance to re-energise the base, reflect a new dynamism, and set new standards as well as an opportunity to choose a full and effective people's leadership and government. We must come out of this congress a brand new and stronger party - a party of excellence. We formed the MDC as a refuge to dictatorship, tyranny, violence, factionalism, unpatriotic politics, corruption and careerism in the former liberation party, Zanu-PF. We can't be what we are running away from. We can't be what we seek to dismantle. The path to congress is going to be characterized by experiments, anxiety and democratic adventures. It is going to be tough and choppy, but we are the biggest party in the country, we will find a lasting solution. We need peace, tolerance, maturity, equanimity and robustness in all campaigns and our choice of quality leaders. We dare not elect lazy leaders who are only active during congresses. We must constitutionally pass the muster with MDC membership and democratic scrutiny. Therefore, we will allow all to go through the democracy mill. Our agenda of growing the party is on course. The MDC is a broad church for all Zimbabweans from all backgrounds and shades of opinion. Being a social democratic, labour-backed party, we seek to cement and consolidate the party's pan-African flair, locate our liberation struggle roots, nationalistic appeal, the national democratic revolution, standing on the shoulders of freedom fighters, war veterans and the liberation narrative. Whereas we are dealing with a violent party, we must be a vibrant and vigilant party. We must show difference and excellence in all the zones of autonomy in local authorities and parliament and constituencies where we have the mandate to lead and represent the great people of Zimbabwe. The MDC must at all times remain a people-centered party, a people's parliament and the people must at all times have a say in shaping the position of our great party. Therefore, when we speak of unity in the MDC, we refer to the united action of the people through the concert of a festival of ideas, as they put aside their racial, tribal, gender and class differences to map out a common national development trajectory. The people shall govern! We must not be extremists causing hatred. We must be measured in our language and tone. What makes the MDC great is the celebration of dissent and diversity. The MDC is intact and growing bigger into a post-independence liberation force, democratization catalyst and transformation agent in Zimbabwe. Nonetheless, we will be vigilant and guard against infiltration and violence from without. Non-members cannot manage internal affairs. We are aware that our competition is working through the witching hours and burning the midnight oil to see the upcoming congress in disarray and to destroy the people's party and throw into jeopardy. We want to grow the base. As I always say, we grow by adding, where necessary by multiplying and never by dividing or subtracting. To add is to strengthen and to subtract is to weaken! We must remain focused on the goal. That which unites us far exceeds whatever might separate us. Together we shine, asunder we are all dust! God bless Zimbabwe. God bless Africa.